Well then this hilarious gag RING gift is just the ticket to laughter... or a black eye! And you can still get her the real diamond ring as well). If you promised her a Diamond Ring, This just may be the one, but you had better know she has a GREAT sense of humor, because a hospital stay can be more expensive than a real Diamond Ring! A real U.S. dime set into a ring. Complete with a beautiful RED VELVET COVERED HEART SHAPED RING BOX! It’s a DIME-ON RING, not ‘’Diamond’’ like she hoped for. 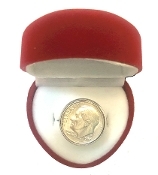 Featuring a real genuine uncirculated US dime, with assorted date year, on an *adjustable silver-tone metal ring base. *Adjustable size fits a range of average finger sizes. Makes a great stocking stuffer, Valentine surprise, Secret Santa gag, Redneck wedding favor, trailer trash engagement ring, or white elephant gift for gut wrenching laughter! The alleged back story tells of a soap company in 1930 advertised that in some of their soap boxes contained a Diamond Ring to improve sales. However, what you found if you were lucky, was a dime made into a Ring. *Warning: Not for children under 3, choking hazard.